R.L. Kiser started writing science fiction when he was 14 but didn’t publish until decades later. He has four fantasy and two western/detective novels as well as a scifi adventure, which received a five star review and made the first cut of the Amazon Breakthrough Novel Award in 2013. 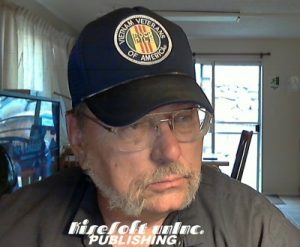 Born in Idaho, raised in Arizona, grew up in Los Angeles, he’s a Vietnam Veteran, been a musician, a Hollywood taxi driver, a computer programmer, a single parent, ran his own Internet marketing business, and is an avid bicyclist. He holds an associate’s degree in computer science. He currently resides in Sparks, Nevada with four computers, four bicycles, and an ’02 Mercedes SUV (no, that does not stand for Small Ugly Vehicle). He’s currently hiding from the ATF, CIA, DEA, DMV, DHS, DMV, DOD, DOT, HUD, ICE, IRS, ONI, SPD, and FBI, but the NSA knows where he is. I can’t really put a finger on any one thing. I’ve had this ability and desire to write since age 14. I started writing science fiction and I was good at it. Like the majority of kids I was good in some things and not others. I excelled in English and composition, was miserable in math. And yet I became a musician and later a computer programmer. Go figure. I write. There is no specific process. I don’t make tons o’ notes, nor write the end and work backwards, nor make outlines. I just write. The ideas flow, I write. The ideas stop, I stop until I get more. Not exactly an efficient process, but it works. When the muse strikes, I obey. It can take a long time to complete a novel this way. I might write for days on end, then not again for months. I sometimes have to force myself to sit in front of the screen and just write something, get the mental process started. Sometimes it’s just not there and I can’t force it. Other times it starts the flow. I do make notes when I’m writing and an idea pops into my head about a section I’ve written, or where the story is going, or sometimes an entirely different story idea develops. Most of my current works were written (printed, my cursive is illegible) on paper, felt tipped pen, pencil, or pen, and had to be put into a word processor at a later date. No, I more live vicariously through them. I like momentarily becoming one character or another. It’s fun being the bad guy without consequences once in a while. Or the hero when he gets the girl. Write! Just do it! Don’t sweat the small stuff like grammar. The most important part is to get the idea from your head onto paper (or screen). Write it down first, then deal with the mechanics. Get that idea outta’ your head first. It’s fleeting at best. I sent out multiple cover letters and requests to agents, including SASE, to no avail. Not one response. There’s no point in going directly to a brick n’ mortar publisher without an agent. Amazon, and in the process Smashwords and Createspace offered a way to self-publish. There is lots of information on how to format, how to submit what. The real difficult part comes after you’re published – promotion – getting people to notice your book. The times, they are a-changing. Electronic publishing is the future. POD (Print On Demand) for paperbacks is the least expensive way to go, but I’ve not had much luck with getting those sold. People like to cruise book stores and have something in their hands. POD is not that. The newer generation is more electronically educated and will hopefully be more prone to order POD, there’s nothing like having a book in your hands, but it’ll never be as effective as being able to pick up a book and read the cover. eBooks are a different story. Less expensive (eg. $2.99 vs $9.99), instant delivery, instant gratification, and generally a higher royalty for the author. E-readers, the software, and ePub standards are constantly changing for the better. This is a major part of the future of publishing.